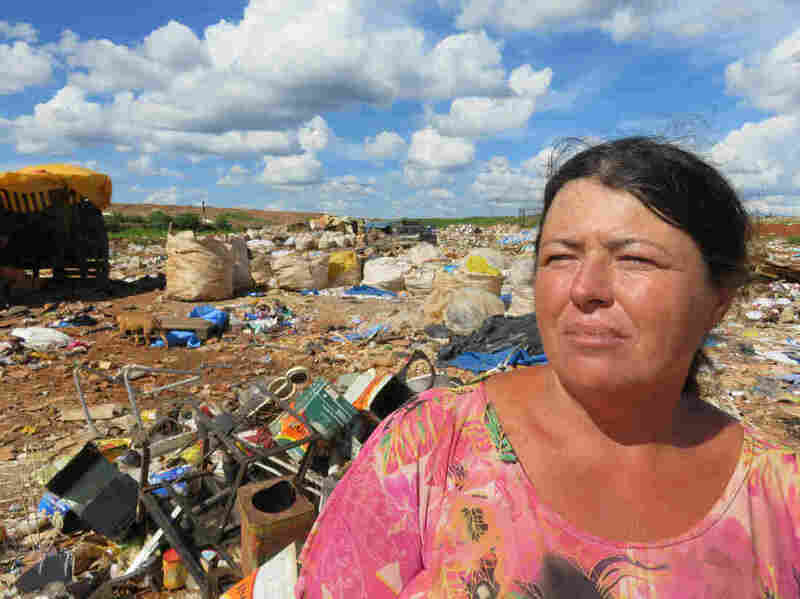 As A Massive Garbage Dump Closes In Brazil, Trash-Pickers Face An Uncertain Future : Parallels Authorities are closing a dump on the outskirts of Brasilia. Some 2,000 trash-pickers, who sort and sell recyclables, depend on the dump for their livelihoods — despite the risk of disease and injury. 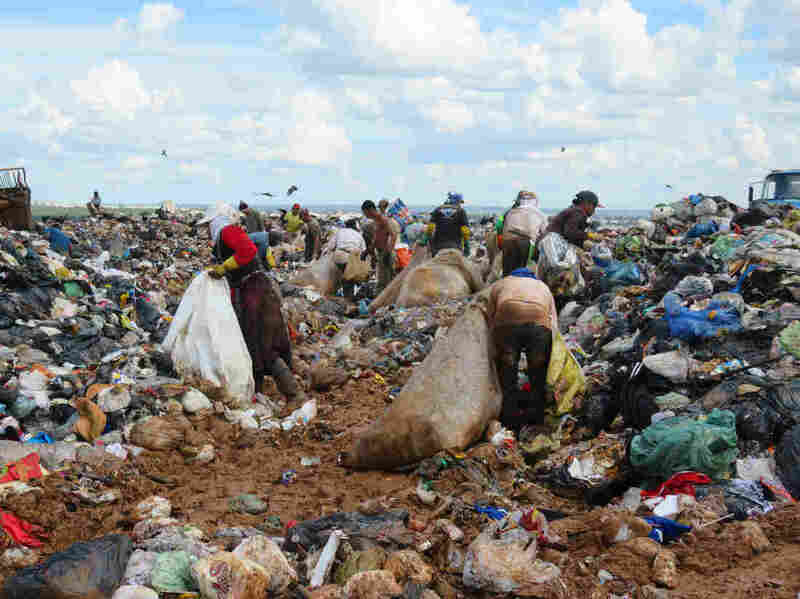 The world's second-biggest garbage dump is in Brasilia. It has been growing since the 1950s, when city planners failed to factor in proper facilities for trash disposal, and now occupies the equivalent of 250 football fields. When the city of Brasilia was inaugurated nearly six decades ago, it was celebrated as a dazzling example of modernist architecture and as evidence of a young South American nation on the rise. But Brazil's utopian capital has since acquired another feature on its landscape that's come to be viewed as a national disgrace and an embarrassing eyesore. A few miles from architect Oscar Niemeyer's world-renowned buildings stands a toxic mountain of trash that has been steadily growing and now is more than 300 acres, roughly the size of 250 football fields. "It is the second-largest open garbage dump in the world," says Paulo Celso dos Reis, who leads a 25-member team of experts recruited by Brasilia's federal district government to help close down the dump. Brasilia's mega-dump evolved because back in the 1950s, city planners failed to factor in proper facilities for trash disposal. Garbage was simply tossed onto open ground, 12 miles from the presidential place, in an area bordering a national park that's populated by deer, tropical birds and other wildlife. "I can tell you, we inaugurated Brasilia without knowing what to do with our waste," says Dos Reis. He describes the dump as a "very, very dangerous place" that's created complex "social, economic and environmental problems." "I was born in Brasilia," he says. "I am not proud of this. We have to close it!" In 2011, a court ruled that the dump was illegal and ordered its immediate closure. After many bureaucratic and legal delays, the dump is finally being shut down this month. Some 2,000 trash-pickers — known as catadores — survive by fishing out plastics, metal, cardboard and other recyclables from the dump to sell to middlemen. More than half the trash-pickers are women — often single mothers in need of cash to feed their families. There is, however, considerable uncertainty and unease about the social consequences. Some 2,000 trash-pickers — known as catadores — survive by fishing out plastics, metal, cardboard and other recyclables from the dump to sell to middlemen. More than half the trash-pickers are women — often single mothers in need of cash to feed their families. The federal district government estimates that 150 children are among the catadores. They work in appalling conditions. On a recent visit, NPR saw catadores rummaging through detritus, calf-deep in reeking mud, watched by hundreds of vultures nearby. There were rats, wild dogs, cockroaches, mosquitoes and huge clouds of flies. Some people had wrapped their faces in cloth to keep out the ghastly smell. Many wore baseball caps and gloves. No one appeared to have custom-made protective clothing. Some worked in flip-flops. The garbage mountain is punctured by squat concrete chimneys, spewing out gusts of toxic methane gas brewed by the trash below. The methane sometimes causes trash to catch fire. According to government statistics, an average of two catadores have died every year in accidents at the dump, including by being mown down by the bulldozers and garbage trucks. The risk is particularly high at night, when the pickers are hard to see in the gloom, despite their headlamps. Miriam Ribeiro Araujo, a 37-year-old single mother, says she's suffered many injuries since starting work at the dump two decades ago to raise money to feed her son. Some of her injuries were caused by syringe needles concealed in trash bags, she says. She shows her hands. They are crisscrossed with cuts — caused, she says, by broken glass. Yet the prospect of the dump's closure worries her deeply. "How are we going to survive?" she asks. She waves away government plans to arrange alternative work for the catadores as "promises, promises, promises." Distrust in government runs deep at the dump. "We are all very suspicious, because the government lies a lot," says Gilberto Ferreira Alves, clad in a mud-spattered brown velvet hat and rummaging around for plastic bottles. The authorities are urging the catadores to join collectives that are being contracted to sort through trash at five new recycling depots. This will provide them with a roof, protective equipment, bathrooms and drinking water, and enrollment in the government social security program. But their wages will be about $200 a month less. Hundreds of the pickers have yet to sign onto the plan. "I would rather stay here than find another job," says Alves. "Here you can work whenever you want. There is no one bossing you." He says he's grown so used to the conditions that he considers the vultures to be harmless "workmates." The only aspect of the dump that appears to unsettle him are the corpses. He says catadores find a body roughly once a month — usually the remains of an aborted baby. Alves says criminals also occasionally carry out murders at the dump, knowing the police rarely venture there. Gardivania Teixeira Lima, a single mother, works at the dump to support her seven children. Her son, now 19, started working there at the age of 8. She says she'd rather have an eye on him than risk him falling into crime on the street. She says the dump's closure is "awful" because "everybody will be jobless." Gardivania Teixeira Lima, a single mother, works at the dump to support her seven children. Brasilia's trash-pickers have specific financial reasons to prefer to stay in this dismal place. 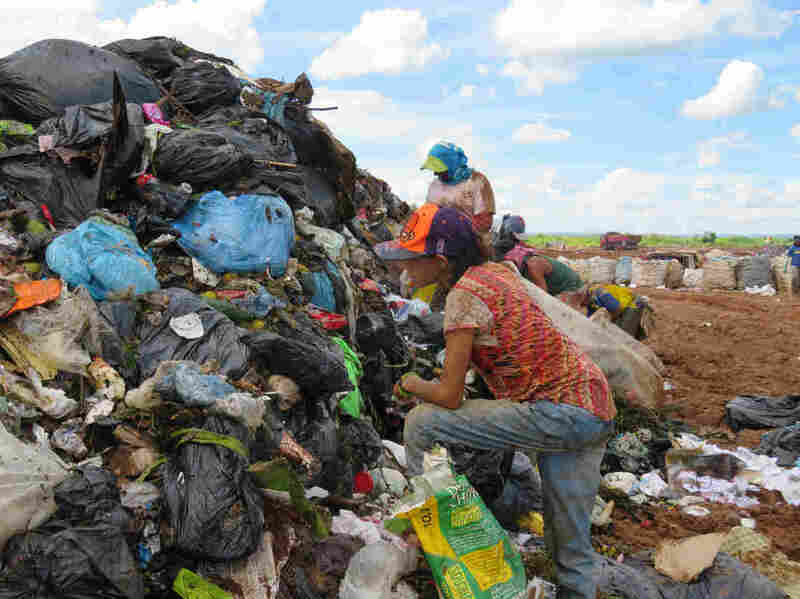 Officials say on average, a catador at the dump earned $620 a month — more than twice Brazil's minimum wage — although only by working 12-hour days, six days a week. The city now has a big new out-of-town landfill. Trash that can't be recycled will go there. Yet there are other complex unsolved issues: Brasilia's government hasn't decided what to do with the 44 million tons of trash that comprise the garbage mountain and are polluting the soil and water below. The dump is located on real estate with potentially enormous value. No one knows what will be the economic impact on the 40,000 people who live in the shantytown that's sprouted beside the dump, where many rely on trash for a living. "It's worrying, worrying," says resident Jose Maria Vasconcelos, 54, who's in the recycling business. Whether most of Brasilia's 3 million people care about these issues is moot. The city enjoys the highest per-capita income in Brazil. Residents weren't much interested in what happened to their trash when the capital was created back in 1960. It seems many still aren't. After years of helping the government figure out how to shut down the dump, Dos Reis remarks: "It's unbelievable. The majority of people in Brasilia do not know the dump exists!"